Playing Games – Grown Up, Now What? Last year Ms. M set up a Ladies’ Game Day. Once a month a group of us would get together and play board (or card) games. It was fun, and the ladies are wonderful. Although my life got too busy for me continue, I’m so glad I was a part, especially since it reawakened my love of games. During our latest camping adventure, Ms. M and I played a lot of games. We played Phase 10, which feels so much like Uno – a long time family favorite. We also played a game Ms. M and her family played decades ago. 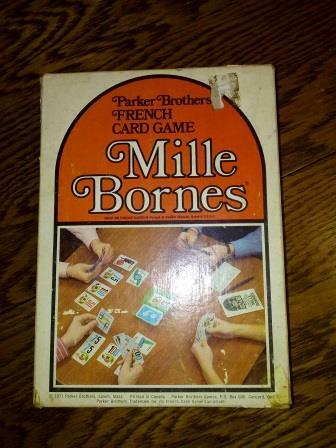 It is called Mille Bornes. Ms. M didn’t remember the specifics to the rules. The 21 page instruction book was rather confusing. After reading the whole pamphlet, it still wasn’t clear how to play. The scoring sheets were confusing, and I was dubious we could figure it out. We decided to press on and try a hand and ignore the scoring to begin with. That was wise. We had fun not scoring our entire first round. It did mean we had to pick an arbitrary ending point – which coincidentally coincided with lunch time. 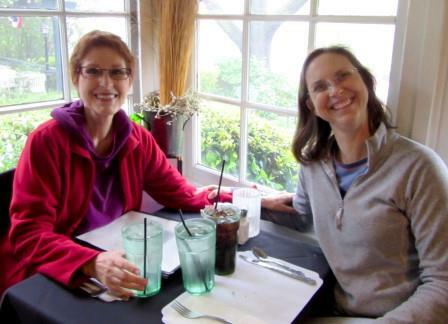 We talked about the game during our glorious lunch in town, and we felt ready to try the scoring rules when we got back. It was so much fun, and a completely different strategy, when the scoring element was added in. Ms. M and I each won a round, and despite a desire to play some more, we ultimately left the tie unbroken. It always amazes me how much fun games can be and how inexpensive they are. I’m bound and determined to keep them a regular part of my life. What was the last game you played? or Have you ever made up the rules to a game on your own? Next Post Rebellious or Unobservant? My family used to play canasta when I was young and when my kids were old enough we play Mille Bourne. I agree about the rules but we got through it. I loved throwing a flat tire on everyone! We yelled coovey because it sounded like whatever the word was on the flat. So much fun! I’ve never played canasta. It sounds even more complicated than Mille Bornes! We never could remember the name of the game to shout out whenever we were able to block the bad cards – it became some strange combination of French phases, and it varied each time!